Sports Minister Stewart Maxwell will have pleased three north east football clubs by saying the Scottish Government would back any bid to host Euro 2012. 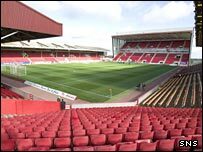 Dundee United and Dundee say they will share a new purpose-built ground if funding was provided - while Aberdeen are keen to move from Pittodrie. And Maxwell told BBC Sport: "We would be happy to work with the Scottish FA in a feasibility study. "I am confident that, if Scotland wants to bid for this, we can do it." The 2012 competition is due to be held jointly between Ukraine and Poland. But both countries have admitted to problems surrounding their hosting of the championship. And SFA chief executive Gordon Smith has stated that Scotland would be interested in being late replacement hosts should the tournament be taken away from Ukraine and Poland. Maxwell thinks the SNP administration in Edinburgh would back any SFA decision to bid for the competition. "We already have four high-class stadiums in Glasgow and Edinburgh and we would need four more," he said. "I think it would be one enormous party and the economic benefits would be fantastic." Maxwell recognised that there would have to be improvements in accommodation and infrastructure. However, he pointed out that Glasgow's hosting of the 2014 Commonwealth Games meant that many facilities were already on-stream. Aberdeen and the two Dundee clubs would be likely to benefit by their cities being chosen as sites for new stadiums. Dons director of football Willie Miller: "We want to be part of any Euro bid." The Dons and the Dundee clubs would be keen to move to the new homes should Government money be available. Dundee Utd director Derek Robertson said: "We'd look at this seriously." Dundee chief executive Dave MacKinnon was equally enthusiastic. "Very early on in my time here I spoke to Eddie Thompson, the United chairman, about this and he was keen on it," he said. "I've also spoken to potential partners like the council and university and they are also enthusiastic. "It would be great for Scotland if we could attract the championship."